Yup. That’s the recipe my sis gave me, and that’s what it’s called, according to whomever gave it to her! Kind of offensive, huh? I’ve never done crack, so I can’t vouch for how addictive it actually is; I’ve just heard that crack is addictive, and so it’s kind of a fitting name for this. This dish is very addictive in that you might have a generous portion of it, and soon want seconds and thirds afterwards! I’ve made this dish a few times now over the years, and it’s one of those dishes that changes, depending on the type of seaweed and furikake I use. I like that part of it. It’s also one of those dishes that I’ve hesitated to post here, partly because this is more of a baking blog, although I have, from time to time, featured non-baked goods. Also, whenever I’m eating it, I’m usually not in a position to take the time to photograph it the way that I’d like, and also because it’s a difficult item to photograph well, I think. But here it is. I was having a conversation about food blogging with someone and about being too critical about the appearance of the foods we eat, versus foods we consider “blog worthy”, and so this is an attempt to include foods that I’m actually eating and enjoying “in real life” and not just primarily to blog about it. While not a pretty picture, it makes up for it in flavor. Thanks, Es! 2. imitation crab meat. You may find that some are better quality than others. Try to select the best quality imitation meat. I’ve never made it with real crab, but I feel like it would be much more expensive to use real crab, and it may only taste slightly better. 3. Use Korean Sheet Seaweed, which usually has a sesame flavor and is more salty. method: Cook rice. Transfer rice to a bowl and let cool slightly. In saucepan, combine rise vinegar with sugar and salt. Heat over medium heat until sugar and salt are dissolved. Remove from heat. Slowly add vinegar mixture to rice and mix together. Set aside to cool. Chop up imitation crab meat and mix with Japanese mayo to taste. Set aside. Layer half the rice/vinegar mixture at bottom of platter. I used an 8 X 8 square pan, but you can use a 9 X 9 pan, also. Add layer of ‘fishy’ furikake. Add layer of imitation crab mixture. Add rest of rice mixture Top with ‘seaweed’ furikake. Cover with plastic wrap loosely, and cool in fridge if not serving right away. 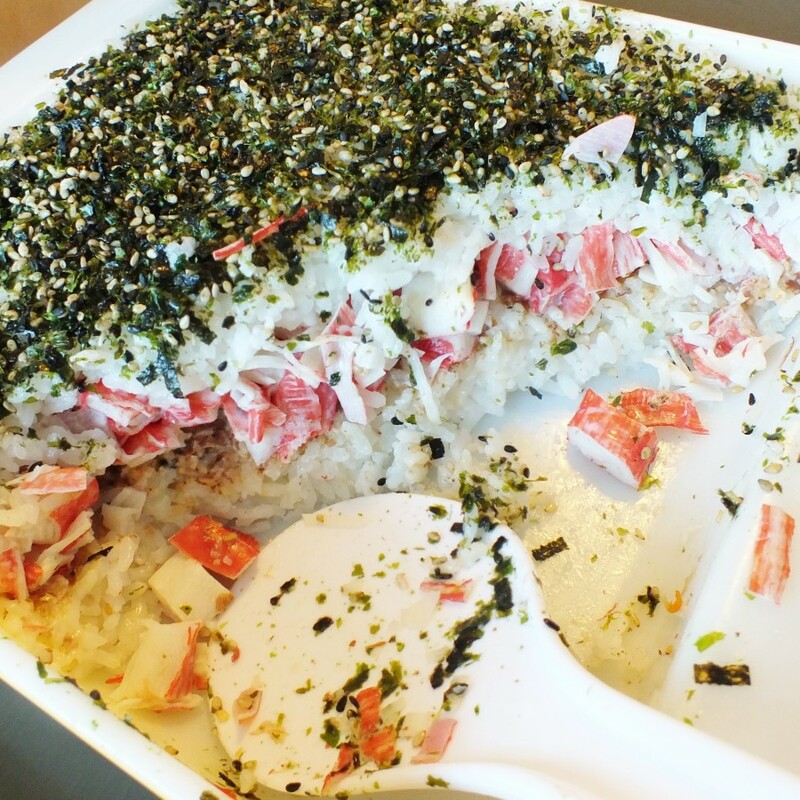 To serve, place a scoop of the rice/crab/furikake mixture on a sheet of seaweed fold it over the rice to wrap as best you can. It’s a little messy to eat. It is good with served with sliced avocado. This entry was posted in appetizer, dinner, healthy, island food, salad, side dish and tagged crack sushi, sushi, sushi salad. Bookmark the permalink. I love this recipe Dave! You gave it to me a few years ago and it’s always a crowd-pleaser! Yeah, I like how easy it is to assemble. I loved making this as a kid growing up in Hawaii. One easy step is to mix it ALL together into one big mess. You just garnish with more furikake on top. Serve with avocado slices with your Korean Kim sheet or even on top of sliced cucumber. This recipe is not set in stone, so you can use regular mayonnaise too if you can’t find a Japanese brand where you live. The difference is that basically a Japanese Mayo would use a soy vegetable oil, and maybe egg yolks instead whole eggs. It might have lemon juice, or added spices, too, and generally might be a tad sweeter and richer than regular mayo. I hope that helps. You’d think living in Hawaii with a large Asian population AND married to a local Japanese man I would have heard of this! Learning new things everyday! I change up the meat… I use lobster meat at times and at other times I use crab meat..
Tiana, great way to change it up. I love lobster when I can get it/afford it. Wow.